VLADIVOSTOK, RUSSIA - Prime Minister Shinzo Abe and Russian President Vladimir Putin on Thursday condemned the latest nuclear test by North Korea as a “grave threat” to the region but remained at odds over the path toward its denuclearization. 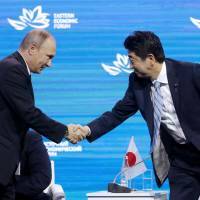 Abe and Putin also agreed in talks on the sidelines of the Eastern Economic Forum in the Russian Far East city of Vladivostok to conduct joint economic activities on disputed islands off Hokkaido in five areas: aquaculture, greenhouse farming, tourism, wind power and waste reduction. Tokyo sees the initiative as paving the way toward resolving the long-standing territorial dispute over the islands and signing of a post-World War II peace treaty, while Russia hopes to attract investments to the underdeveloped region. Abe and Putin met for the third time this year and 19th overall, at a time of heightened tensions over North Korea, which conducted its sixth nuclear test Sunday following recent missile launches in defiance of U.N. Security Council resolutions. “We need to continue dialogue,” Putin said, in stark contrast to the position of Japan, which has said now is not the time for dialogue in curbing North Korea’s nuclear and missile ambitions. The U.N. Security Council is currently debating imposing tougher sanctions on North Korea, with Japan and the United States pushing for an oil embargo on the reclusive state. Abe sought to get the support of Moscow to strengthen pressure on Pyongyang, as Russia is a veto-wielding member of the U.N. Security Council and has close ties with North Korea, but the Japanese official refrained from commenting on Putin’s response. But Putin praised the recent expansion in Japan-Russia trade and business ties. “The cooperation between Russia and Japan reaches beyond Russia’s Far East,” said Putin, who invited Abe to attend another economic forum to be held in St. Petersburg in May. Regarding the joint economic activities on the Russian-held, Japanese-claimed islands, Abe and Putin agreed that a group of Japanese government officials and experts from the public and private sectors will conduct their second round of studies on the islands around October, the official said. As the two sides remain far apart in their stance on sovereignty over the islands, they would need to find a way to conduct the activities that does not compromise their respective positions or create legal problems. A working group would be set up to speed up talks on how to ensure that the envisioned projects would not hurt their respective legal stances, the official said. They need to clear issues such as which laws would be applied in implementing the projects. 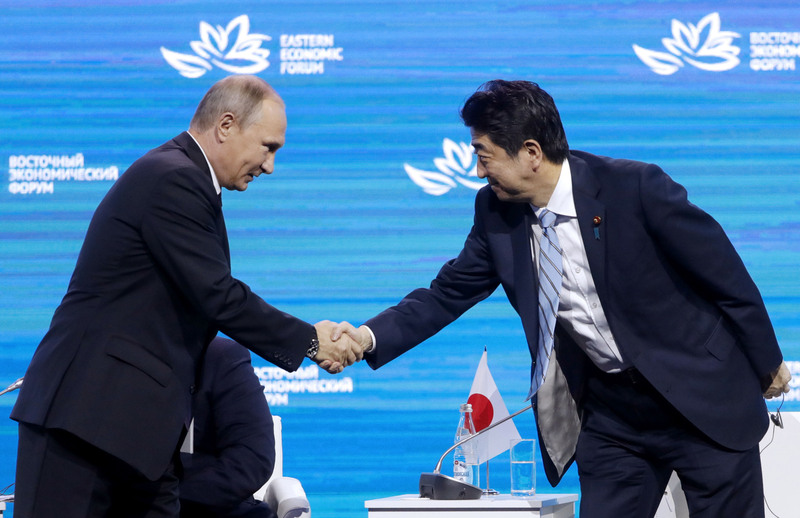 In a speech given to the plenary session of the economic forum Thursday attended by Putin, Abe underscored the need to “put an end to the unnatural state” of the two neighbors lacking a peace treaty 72 years after World War II. “Vladimir, why don’t the two of us fulfill that responsibility?” Abe said. When Putin visited Japan for the first time in 11 years last December, the two leaders said they would negotiate the legal mechanisms required for holding joint economic activities, and that such agreements would not harm the political positions of the two countries. The islands of Etorofu, Kunashiri and Shikotan and the Habomai islet group were seized by the Soviet Union after Japan’s surrender in August 1945 ended World War II. They are called the Southern Kurils in Russia and the Northern Territories in Japan.